← Best Football Trick Shot Video Ever! Really? Dude’s last name is Gay and “Ads by Google” came up with that gem at the bottom of my YouTube screen? Fail. That snapshot is from the SDSU Aztecs press conference video from today. BYU Cougars are coming to town on Saturday. Here’s a link if you want to watch it. Go Aztecs. The Show is ready for you Jimmer. See here to find out how they’ll be preparing. 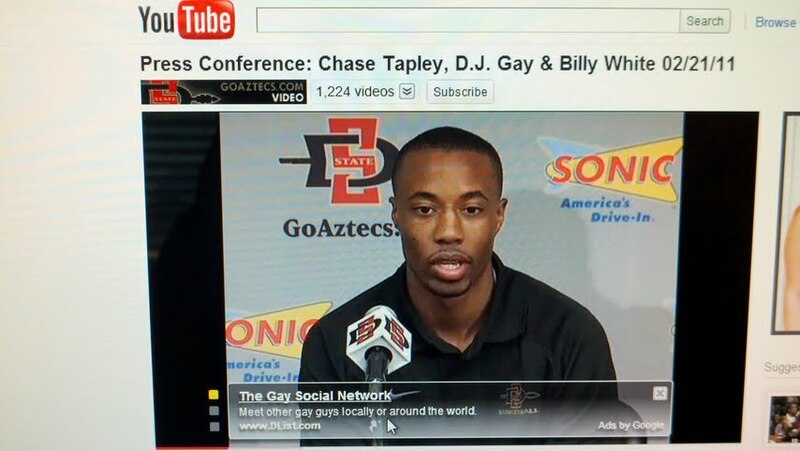 This entry was posted in Basketball, NCAABB, News and tagged Aztecs, DJ Gay, SDSU, SDSU Aztecs, The Show, YouTube. Bookmark the permalink.